Chatham High Street became the unlikely scene of a shark attack earlier this month. Caroline Clarke, Community Engagement and Social Responsibility Advisor for the Diocese, was joined by Sid the Loan Shark and other local civic, community and Trading Standards representatives to handout leaflets raising awareness of the dangers of borrowing money from loan sharks and to give details of ethical banking via Credit Unions. "I think it’s good that the church has identified the problem here and is bringing other agencies together to combat the threat." 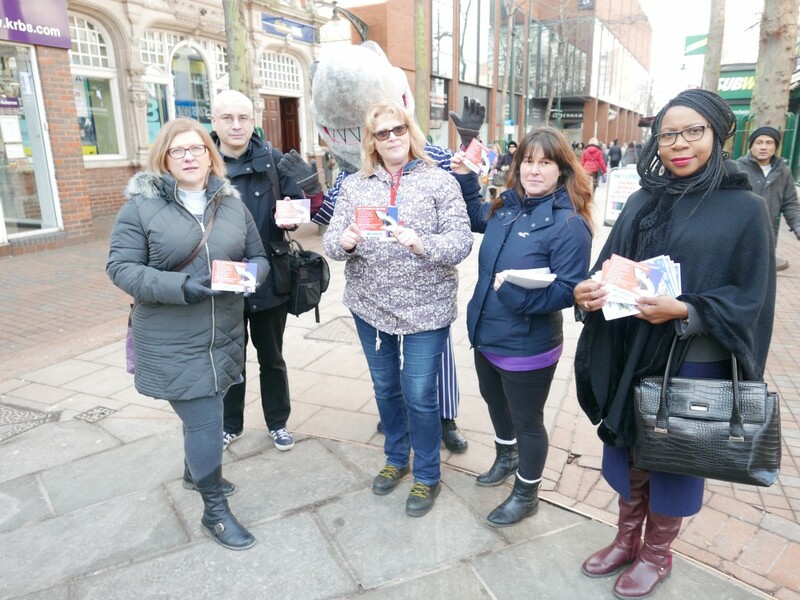 The leaflet drop was organised in partnership with the Illegal Money Lending Team (IMLT) – a specialist unit that investigates and prosecutes loan sharks. According to the IMLT, more than 310,000 households in the UK are currently using illegal money lenders, who destroy lives and can push victims to suicide due to the extreme misery, fear and violence they cause. It came ahead of a Charter signing at the end February which saw Bishop James pledge to support a commitment to ‘Zero Tolerance to Loan Sharks’. Representatives from across the Diocese joined him in committing to Stop Loan Sharks preying on local communities and included the including civic dignitaries, Kent Police, Council Leaders and Councillors, local Credit Unions, CAP Centres, Trading Standards, Citizen’s Advice Bureaus, Community Wardens, and the school ‘good finance’ project LifeSavers. People are driven to borrow money from loan sharks for a variety of reasons and so as part of the Diocese’s pledge, Stop the Loan Shark resources are being made available to churches through the diocesan website, social media, and by offering to facilitate talks and workshops from the Illegal Money Lending team. “Our awareness raising on this particular issue is part of our year-long drive of activity across the Church locally called #Hope2018. This campaign is about ‘setting captives free’ from social issues such as addiction, modern slavery and debt."